Iceland is a fantastic country. It is unique, due to its location, climate and identity. Here you can swim in the hot geyser lakes, enjoy unforgettable scenery, watch the life of whales and seals, play golf on the ocean shore and much more. You can visit national parks and natural areas, enjoy extreme sports and observations of wild animals. If you really want to know everything about Iceland, you should never miss a trip to the glacier! Hiking to the glacier is gaining more and more popularity among travelers. You will be provided with professional guides, who know everything about safe climbing to the glacier. This kind of holiday is ideal for fans of outdoor activities. In this journey during the trekking part, you can enjoy the beautiful and uninhabited beauty of the island, which is inaccessible to many tourists! Dozens of waterfalls and miles of lava fields covered with the softest moss, extinct volcanoes and blue thousand-year-old ice, the coast of red sands in the West and the black ones in the South, fascinating fur seals and huge humpback whales, red-nosed puffins and shaggy Icelandic horses, puddles and milk rivers of the Blue Lagoon, are known all over the world. You would see it all and bear in your memory! It is better to rent a car in Reykjavik Keflavik International Airport, this way you will not miss a thing! Your holiday could include a hike through the highlands of the western fjords of Iceland. An interesting route and the spirit of adventure for an affordable price-what could be better? This holiday is ideal for photographers. You should take shoes, which are suitable for hiking, a hat and gloves with you. You can stroll on the ice of the glacier, follow the stream of the waterfall and explore the black volcanic beach in one day. Here is the list of the most picturesque glaciers in Iceland. It is in the south of the highlands in Icelandic. The glacier covers more than 550 kilometers’ square north of the Vík village. Its highest peak is about 1400 meters tall, making it the fourth among country’s largest ice caps. Mýrdalsjökull is located atop the Katla volcano, which is explosive and notorious. Since 930 AD, Katla volcanoes erupted, on average, once every fifty years. As there is a glacier above it, the ash clouds, which are caused by eruptions, are enormous. This area was almost not settled for this reason. The last time it was heavily erupted, was in 1918, covering the land with lahar floods for five kilometers outwards. During the eruptions, this area is also susceptible to glacial floods. Nevertheless, the volcano is always monitored, and during the increased seismic activity, the roads around it are closed, so tourists are having nothing to worry about, when they are on holidays there. From October to April, ice caving tours beneath Mýrdalsjökull are held. Throughout the year, it is possible to snowmobile across the glacier’s surface. People are coming from both Reykjavík and Vík in order to enjoy the glacier. If you are staying in Vík village in clear weather, the beauty of Mýrdalsjökull could be perfectly seen. 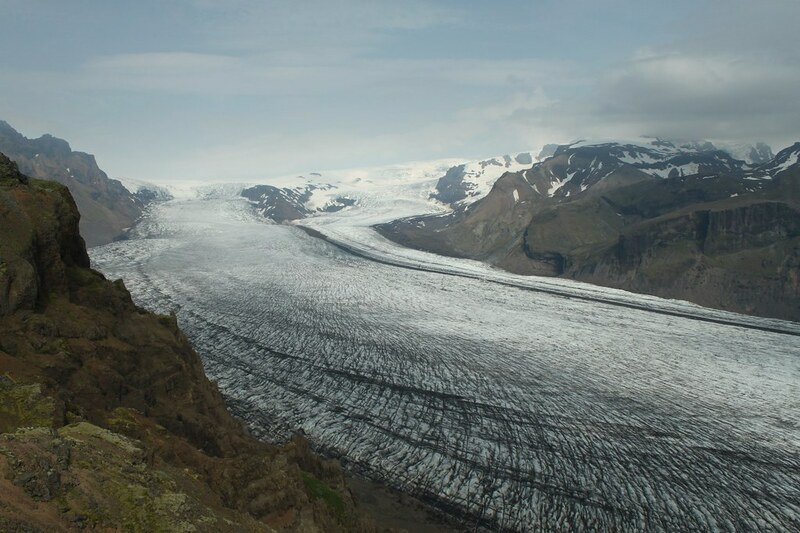 However, the best views over the glacier could be found on the hiking trail called ‘Fimmvörðuháls’. It goes between Mýrdalsjökull and Eyjafjallajökull. You can choose a complete three-day route to Skógar, or take a part of it, which is done in a day. The Sólheimajökull glacier is a part of the large Mýrdalsjökull, the fourth largest glacier in Iceland, where, beneath the ice, the famous Katla volcano is hiding. Travel through the farmlands of southern Iceland, and you will find black volcanic beaches, powerful waterfalls, frightening volcanoes and magical glaciers. After discovering the amazing Myrdalsjokull, you can set off on a wonderful glacier trek. You will be given a safety briefing before heading to your wonderful walk. This hike is a category of the easiest and is it suitable for participants, who are older than 10 years and who can walk on uneven surfaces. On the way, we recommend you to stop by the Seljalandsfoss waterfall, where you can stroll behind a veil of water. On a clear day, you will enjoy an amazing view over the famous volcanoes – Hekla and Eyjafjallajökull. Appearing at the foot of Eyjafjallajökull, you can see the western islands, rising abruptly from the ocean a few kilometers from the shore. The pearl of southeastern Iceland is no doubt, the largest glacier in Europe – Vatnajokull. As the ice caves under this glacier are accessible only from November to March, this makes many travelers to come to Iceland in the depths of winter. The color of the ice in the caves is blue and very bright. The glacier’s area is 8200 square km., which is more than all other glaciers in Europe combined together. The lagoon, formed by the melting of the Vatnajokull glacier, proves that Iceland was fairly called “the land of ice”. In the clear water of the lagoon, reaching a depth of more than 300 m, year round icebergs of the most incredible sizes and shapes are drifting. At the place, where this glacier is, the episodes of the films about James Bond “Die another day” and “License to kill” were shot. You can make a fascinating cruise along the lagoon on the amphibian and see how the icebergs break off the sliding ice tongue afloat. You can even take a small piece of ice as a souvenir, the age of which is 1200 years old, to break it into small cubes at home, and, putting them in a glass with a drink, make sure – they almost do not melt! Traveling south of Iceland, along the majestic Mýrdalsjökull glacier, towards the glacial lagoon of Jokulsarlon, you would see one of the most magnificent natural pearls of the southern and southeastern parts of the island. After a brief stop in the small Vik village, and exploring the Reynisfjara area, travel east, to Skaftafell, crossing many glacial rivers and the lava field. This is the largest national park in the country where the Svartifoss waterfall is located, surrounded by unusual basalt columns. We also advise you to travel along the Glacier Lagoon on the amphibian from April to October (if the weather conditions are suitable).